For the people who hope to hear the guy with the chain saw, that I promised a few weeks ago, or people who want to hear some mean rock’n’roll: you can skip this episode, because this is musical geek stuff. Today’s subject is the Holland Music BV. Holland Music BV was an organisation that sold sheet music. At least, that is what I make out the little information that I have about Holland Music BV. 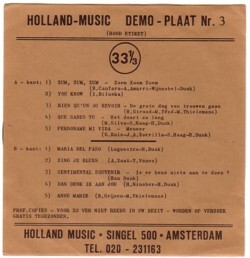 Actually all I have, are four 33rpm flexi records, that were published by Holland Music BV between 1965 and 1971. There must be more, because these flexi records are numbered 2,3, 5 and 7. But not much more, because #2 is from 1965 and #7 from 1971. On each record are excerpts of 10 - 14 songs, and the voice of a man, who says a few words about the songs. This probably will sound rather boring, and it is: the songs are not really the black gold that we are digging for. But I am not only interested in records, i am also interested in the music industry, how it works, and where the money goes. This is not something I want to write about too much in this Soundtrack. For those who can read Dutch, you can find some articles I wrote on these matters here. I will write about a few aspects of the copyright issues later in this Soundtrack, but not today. The most interesting thing on these four flexi’s is a fragment of a song that was especially composed to promote live music, as a reaction to the fact that more an more live musicians were replaced by disc jockeys. Not only the song itself, but also the clumsy logo, explains why the campaign never made the history books. I would love to have the original record, but I doubt if it exists. I have never found any reference to this campaign anywhere. I made a little montage, including the fragment of this protest song. Ha ha, brilliant tune. Funny how they attempt to be “funky.” Nice find!